I encounter some interesting people throughout my day. Because I work in a large place…the people are rather…eclectic. They say some really off the wall things to me. Things, that if I didn’t know their personality, would probably make me feel really bad! I have to wonder if I’ve said inappropriate things to pregnant women before and just never gave it a second thought because I meant well! Size of baby: Um…maybe 3lbs? I don’t think they update what size they think she is until we do another ultrasound. 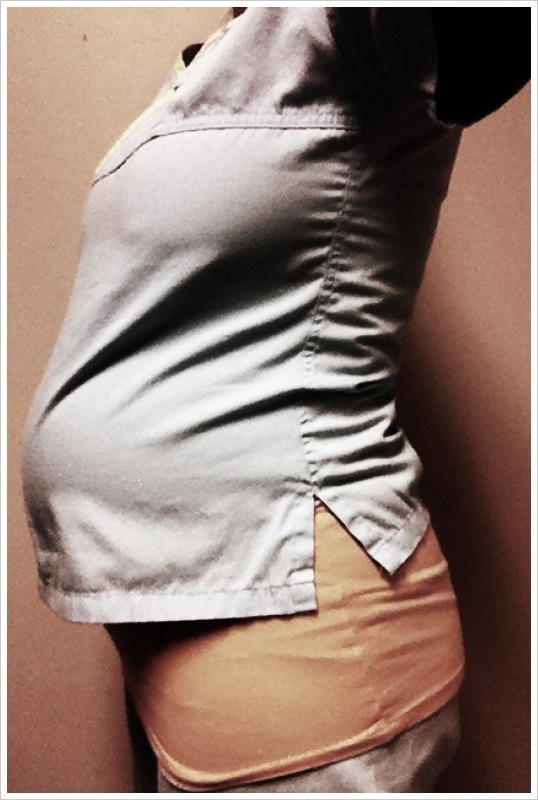 They DID say I was measuring a week ahead (at 32 weeks)…which is a change because I WAS a week behind. I’ve done some major growing in 2 weeks. It’s pretty evident to myself and others. Sleep: Hah. No. 3-4 hours a night. And it’s usually not quality sleep. What I miss: Sitting and standing comfortably. The only comfortable position is laying down on my side…even when I sit, my stomach presses against my legs! EW! Cravings: I can’t really pin point any cravings this week. A lot of the time, I feel like there’s just no way that anything else can fit inside of my abdomen…maybe that’s why I don’t really specifically crave anything right now. Don’t get me wrong, I eat A LOT. Symptoms: Ugh. My pelvis hurts really bad. My feet are a close second with hurting today. Unpleasant things are happening to my bust. I don’t even have the guts to go mention what they are. Clothes: I LOVE FRANCESCA’S!!! They have stuff that I would wear on a normal day (and will later). I’m not super duper into maternity stores. Well, except for pants. Regular pants don’t work for me now. I have even grown out of some of my maternity jeans. No bueno. I started painting our cabinets so they don’t look so old fashioned. The doctor assured me that the baby is not falling out. Contrary to what I have been thinking. The pressure is crazy! It’s teen mom tuesday. The best night for television ever. Too bad this is the last one for a while! Although birth class was terrifying, we had a moment of laughter during what was supposed to be meditation. I almost peed my pants I was laughing so hard at John.